Muxlab 500760-RX är en mottagare för att ta emot Audio ( 2 kanals ) och Video ( i formen av HDMI och Displayport ) över ett nätverk. The AV over IP 4K/60 Uncompressed Extender, UTP allows HDMI and DisplayPort source equipment supporting up to 4K @ 60Hz resolution to be connected and extended to create a 4K/60 HDMI based Video Wall, Virtual Matrix Switch, and Virtual Splitter arrangements of user configurable size (X by Y) supporting 100’s of screens, depending on network bandwidth, utilizing one Receiver for each display in the array. 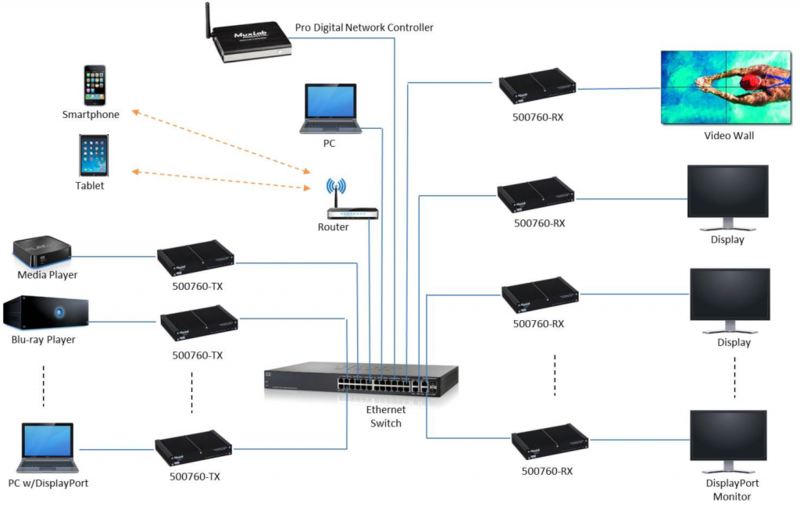 Each Transmitter (500760-TX) and Receiver (500760-RX) can be connected via Cat5e/6 cable up to 330ft (100m) from a 10Gig Ethernet Switch. The Transmitter supports 2CH audio insertion and the Receiver supports 2CH audio extraction. The Transmitter and Receiver, each come with a power supply, an IR Emitter and IR Sensor for IR based remote control applications, a wall mount bracket kit for securing the unit to a wall and a 4-pin terminal block connector for RS232 connectivity. 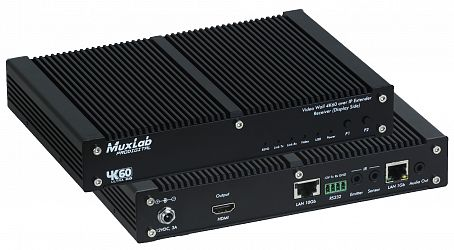 The MuxLab Pro Digital Network Controller (500811) is available to simplify centralized configuration and control, software updates and allows for third party smartphone and tablet management. Supports Video Wall, Virtual Matrix Switch and Virtual Splitter configurations. Supports point-to-point, point-to-multipoint and multipoint-to-multipoint applications.